by Ray Bradbury, 1951, 281 pages. TLDR: Five stars for classic stories that still resonate. Simon and Schuster rescently released a number of Ray Bradbury books with really nice covers so naturally I was forced to buy them. These included Fahrenheit 451, The Martian Chronicles, and The Illustrated Man The latter two are in bonafide pocketbook format, which is a treat! 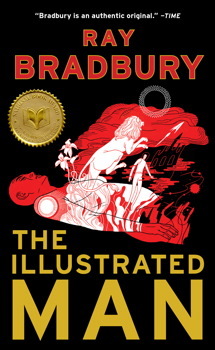 The Illustrated Man contains 18 SF short stories of the kind that only Ray Bradbury could come up with. They range in subject matter, but all of them make you think. A surprising number of them (surprising to me, anyway) feature contact with Mars, even though only a few (as far as I can tell) were adapted into the Martian Chronicles. Many of them use 'first contact' as a way to explore some aspect of humanity, and to put a twist on it. A number were turned into TV episodes for Ray Bradbury Theatre, and others became radio dramatizations for X Minus 1 (which you can listen to if you check out @Ray_Otus ' Old Time Radio collection). One of these stories inspired Elton John's Rocket Man. Those stories might be familiar to you. But you'll find others in here that aren't. Yet they all are somehow familiar, because Ray Bradbury had a keen sense of the 1950's American psyche and was really good at putting it on the page. Recommended for all. The stories are a bit dated in terms of language (nobody says 'rocketship' anymore) but the stories and themes are timeless. There's a really good radio adaptation of Fox and the Forest. Here it is from Dimension X (retitled "To the Future"). There is a more polished recording as part of Bradbury 13 which I can post if you are interested, but I kind of like this old scratchy one better. Bradbury always just sits there quietly on the shelf waiting for you, doesn't he? No one really goes around trying to push his books, and yet everyone knows how good they can be. And then one day you pick up one -- because the clamor has died down about other books or because a cover attracts you or for some other random reason and -- boom. Bradbury. Sumptuous metaphors executed in a simple midwestern voice. Relevant topics swaddled in imaginative science fiction trappings. Genuine feelings behind it all. Bradbury.